So here is to new beginnings, not the same, but new. This spring I opted to not take on any new projects. Rather, I opted to finish some old projects and complete some enhancements. I have spent my fair share on plants and enhancements this spring. Mother nature has thrown a few curve balls this season. Unseasonable temperatures, forest fires, dry weather and monsoonal flows. But, I continue on towards my goal. 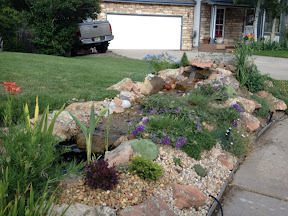 The scree bed is now four years old and the Rock garden water is in its third season. 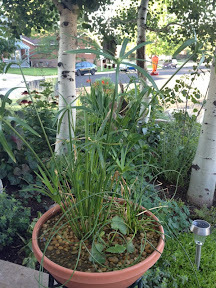 The perennial bed has been in transition as the aspens mature. Typically aspens are not viewed as a great shade tree. 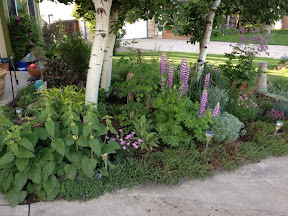 However, with compost, proper watering, and some great annual pruning I have created nice, compact aspens to accomplish this. 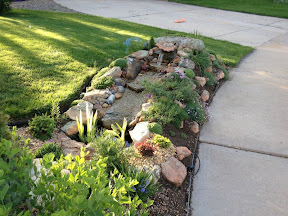 I continue to purchase rock garden plants for both the scree bed and rock garden bed to achieve my desired look and textures. At this point I estimate I have room for about a dozen more plants before it goes to maintenance mode. A variety of textures is important. I find my prospects in a variety of places and ways. My childhood BFF and I have attended the Denver Botanic Gardens plant sale for the past five years. I can always find something there! I fell more in love with the fantasy, or as I call them miniature trees, this spring. Having found a local supplier with a good selection. You can find them at a local supplier too or check out www.twogreenthumbs.com. They are fabulous in the ground, in containers or in miniature fairy gardens. I snip them gently back periodically to maintain their shape. I have purchased about ten this spring. Here is a sample below. I made some new additions last year and I cannot recall if I shared or not. This is my succulent pot. I bring it into the dining room to over-winter and enjoy the warm winter sun. 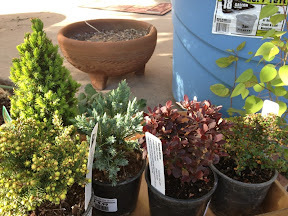 This spring while I was attending the DBG plant sale I purchased some bog plants. 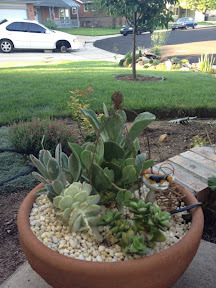 I bought plastic pot less the drain hole, filled it with regular garden soils and a bit of compost, planted my plants, and topped it off with some small polished river rock. I purchased some shade plants from www.plantdelights.com. 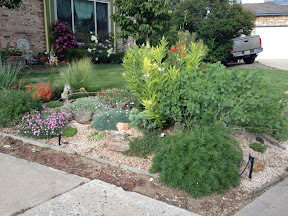 Some of them are, for Colorado, what I consider specialty and rare plants. Some of them are just other varieties of species I currently have. I will probably do a separate post on these. The rock garden is filling in rather nicely. I am very pleased. 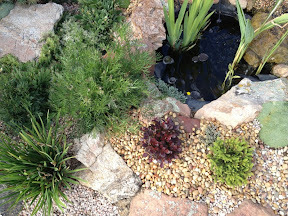 The pond plants are doing very well and are ready to be divided. 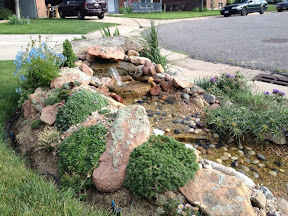 I winterized my pond each fall because it is small. I disconnect the pump and filter and move them into a large Rubbermaid tub in the basement for the winter months. NOTE: water has to be added periodically. So hopefully later this week I will be dividing them and along with my Iris and giving them away. Some of other enhancement purchases this spring included a set of submersible LED pond lights. They provide a great atmosphere in the pond as the lights wave from the falling water movement. Great silhouette and shadows. I added a small birdhouse and a hummingbird feeder. No hammers yet, but I am hopeful. They have visited before. That is about it for now. 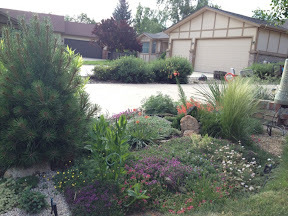 In the future I will share thoughts on using rock in your gardens, summer prunings of perennials to keep the garden looking fresh, and the perennial garden. 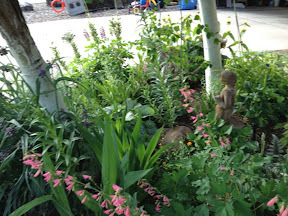 I have also been working on plant lists with photos of my gardens to share. For now, enjoy my photos! what a great post, dear. I am still amazed at what you have accomplished in such a small place.